All transactions are safe and secure with a reliable history in online purchasing behind each of our associates. Buy the Afternoon Delight t-shirt to own Anchorman clothing and merchandise. Show everyone that you know what love is with this stylish Afternoon Delight t-shirt. When the guys ask Ron Burgundy to explain what it feels like to be in love, he responds by singing the song "Afternoon Delight" by the Starland Vocal Band. 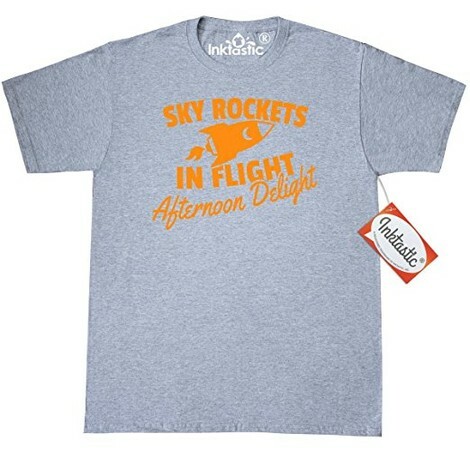 This tee features a colorful image of a sky rocket, along with the text, "Sky rockets in flight, Afternoon Delight." Available in a variety of different colors, this Afternoon Delight Anchorman t-shirt is a fun way to celebrate your love for the Will Ferrell movie. In addition to the Afternoon Delight tee above, browse the Anchorman Clothing Gallery for more apparel like men's and women's clothes, kids shirts or hoodies.